Who heck are Jack and Laura? Laura leads with connection through vulnerability. She is the heart and soul of the projects we take on. She cares deeply for the happiness and fulfillment of children and is constantly searching for and finding more effective ways to live in communities based on trust. She is our creative drive, always thinking bigger and dreaming up new ideas. Jack struggles with rules, being told no, and sitting still. He is our technical support, finding ways to make the impossible possible and turn emotional instincts into logical processes. Never one to shy away from a problem, he is constantly searching for new truths and better ways to tell stories in the current contexts. Jack went to school for Industrial Engineering, the study of processes, at the University of Pittsburgh and Laura for Painting and Drawing at SUNY Purchase. After graduating we had no idea what to do or how to “spend the rest of our lives”, so we ran away. In classic millennial fashion, we packed up Laura’s 2000 Honda Civic and hit the road. We wanted to see the country, find ourselves, have an adventure… I think mostly we wanted to be together and didn’t know how. I had never been west of the Mississippi and we thought let’s take three months and have a road trip. 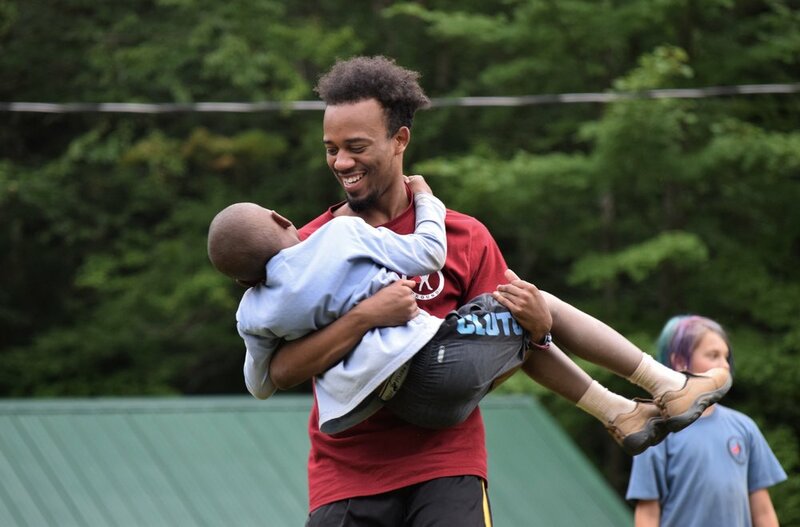 In 2015 we bootstrapped a little not for profit sleepaway camp dedicated to radical empathy. We built a website, found a facility to rent, and started recruiting campers and staff. That first summer, 2015, we ran for one week and had 64 campers. It was awesome, and it was hard. We learned a lot, and the biggest thing we learned was that Stomping Ground, our camp, will always be about mistakes. Making them, owning them, and working through them. Stomping Ground has become our love. The thing we go to bed thinking about and wake up excited to work on. It has grown from that little side hustle to a pretty big operation. This summer we will serve about 500 campers over 6 weeks and hire more that 45 staff. Interested in working with us? It’s hard to admit that we aren’t perfect, but it allows us all to find new and interesting ways to partner together. Being able to make mistakes in a safe supportive community allows all of us to try new things, learn, and find authentic connection. None of us are perfect. No one really knows the answers. By deciding what we want and going for it we learn. We learn how to get more of what we want, but we also learn if what we thought we wanted is what we are really hoping for. Brene Brown, research and author, once said “Vulnerability is the birthplace of connection and the path to the feeling of worthiness. If it doesn't feel vulnerable, the sharing is probably not constructive.” By accepting and owning our mistakes we hope to start the path to the feelings of worthiness within our community. We choose this story to describe who we are because it characterizes what we care about. That admitting we aren't perfect isn't defeat it is freedom, but it is also the beginning. We are enormously lucky, have worked hecking hard, and have a lot more we hope to accomplish. I hope this story humanizes us, inspires action, and allows for empathy.